The Ventilation-Perfusion Ratio (V'/Q' Ratio) of a normal lung is not uniform and displays variation along its vertical axis when an individual is standing upright. The vertical variation in the (V'/Q' Ratio) is simply a product of the relative vertical variations in pulmonary blood flow and ventilation distribution. As discussed, in Pulmonary Blood Flow Distribution and Pulmonary Ventilation Distribution, the action of gravity results in a vertical gradient of both blood flow and ventilation in the upright lung. Although both blood flow and ventilation are lowest at the lung apex and highest in the base, the vertical gradient for blood flow is wider than that for ventilation. Consequently, when the ratio of ventilation to perfusion is calculated, the V'/Q' ratio is highest at the apex of the lungs and lowest at the base. 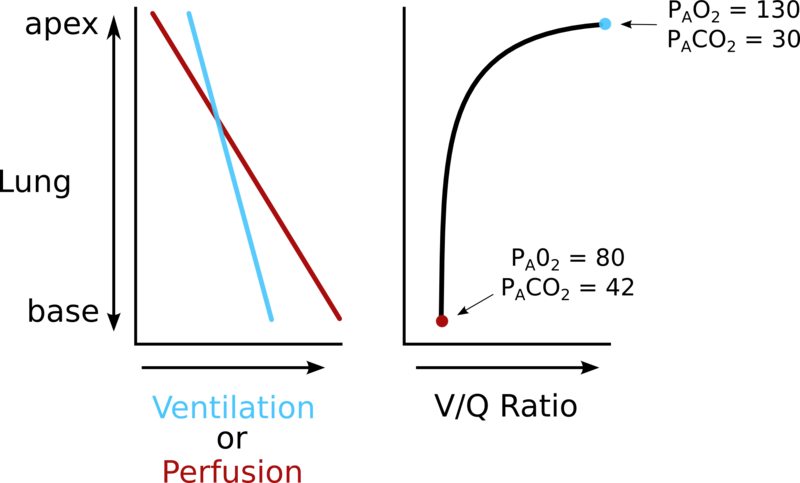 Both ventilation and perfusion increase toward the base of the lung; however, perfusion increases to a greater extent. The result is a large vertical variation of the V/Q ratio when the lung is upright. Higher V/Q ratios in the apex yield alveolar gas tensions closer to inspired air whereas lower V/Q ratios in the base yield alveolar gas tensions closer to venous blood. The V'/Q' ratio of the upper lung levels is quite high, yielding alveoli that are well-ventilated but poorly perfused. Consequently, as discussed in ventilation-perfusion Ratio, these alveoli will display high partial pressures of alveolar oxygen (PAO2) but low alveolar carbon dioxide (PACO2) tensions. As a brief aside, the high oxygen tensions in upper lung fields may be one reason why reactivation pulmonary tuberculosis tends to occur in these locations. In contrast, the V'/Q' ratio of the lower lung levels is somewhat below the normal value of 1, yielding alveoli that are better perfused than ventilated. Consequently, these alveoli will display slightly elevated PACO2 and slightly depressed PAO2 values. Because the alveolar partial pressures of CO2 and O2 largely determine the tension of these gases in the blood leaving the perfusing capillaries, blood in the pulmonary circulation draining the different levels of the lung will also display differences in the oxygen and carbon dioxide tension. Ultimately, the blood from these different levels mix, resulting in an averaging of the carbon dioxide and oxygen tensions in mixed arterial blood. However, as discussed in pulmonary blood flow distribution, significantly more blood flows in the lower zones of the lung compared to the upper zones; consequently, the tensions of oxygen and carbon dioxide in mixed arterial blood become heavily weighted to that of the blood leaving the lower lung zones. Additionally, because of the shape of the Oxygen-Hemoglobin Binding Curve (See: Oxygen Transport), the additional oxygen tension present in the upper lung fields does little to improve total oxygen carrying by the hemoglobin, as nearly 97% saturation is reached at V'/Q' Ratios of 1 where the PAO2 is 100 mm Hg. Consequently, the regional variation in V'/Q' Ratio distribution results in a slightly lower capacity of the upright lung to oxygenate blood and exhale carbon dioxide. This results in a small, but measurable A-a Gradient in the normal upright lung although this is of little significance in a healthy adult. However, one reason why the capacity of oxygenation by the lung improves with exercise may be that regional differences in V'/Q' Ratio are eliminated during heavy activity.